Get down to basics with the personality test. Do it yourself, or let the site match you. It's less expensive than eHarmony. Can wait forever for matches. Deal breakers don't go far enough. PerfectMatch offers daters the choice between DIY dating, or being matched by their DUET compatibility system. Going it alone means you can browse around and choose who to contact. Otherwise leave it all up to their auto matching system. The matchmaking system will tell you who you are most compatible with – based on your personal survey. PerfectMatch is a cheaper option than eHarmony but it offers a similar experience. When PerfectMatch first came out, it was one of a handful of sites that was setup to help people find lasting relationships – a marriage partner, long-term spouse or something along those lines. Of course there are lots of other choices nowadays. But we have to respect the fact that PerfectMatch was one of the pioneers. 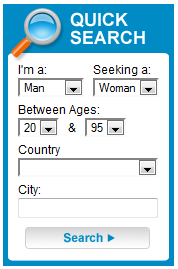 To this day, users of PerfectMatch are still asked to fill in a long personality questionnaire. They call this the “Duet” total compatibility test. Created by leading relationship specialist Dr. Pepper Schwarz, the test tries to find people who’re “romantically suited” using a secret scientific recipe. If you’re not comfortable with these kinds of questions, you’d most probably be better off on a different site. DIY or Wait to be Matched? Once you’ve filled in your test, you just wait for matches to arrive. 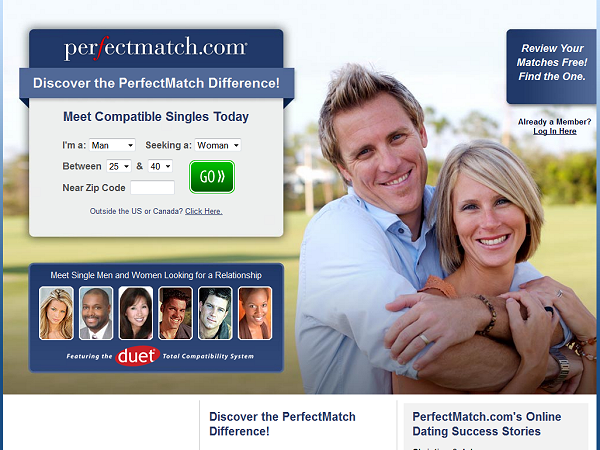 There are a few differences between PerfectMatch and other matchmaking sites in this category. Other sites like eHarmony and Parship also have a compatibility system that users fill in. But the good thing is on PerfectMatch you can do it yourself if you want! You don’t have to wait to be matched. With sites like eHarmony and Parship you can’t just browse around and look for people on your own. You have to wait for their matching system to find people for you. The matches you get are people it “thinks” are compatible with you. Some daters see that as a big drawback. Others see it as an advantage. If you’re in the first group, you probably like to be spontaneous and look around a site and see who takes your fancy. When you find someone who sets off fireworks, you just pop a message in their inbox. For others, this browsing around is just a pain and takes too long. They prefer to have the site work for them rather than the other way around. If you’re busy, it just makes more sense to have suggestions popped into your inbox. Rather than having to check on the site every day or two, you just sit back and wait. With PerfectMatch you can do either. What I found with PerfectMatch is that there can be a long wait for matches to arrive in your in-tray. I waited about 2 weeks for my first matches. Now I know this might not seem like long, but to others it’s an eternity. How long you wait will vary depending on your preferences and where you live. One new feature that’s been added is called “ice breakers”. These should really be called “time savers”. When you first meet someone on a website, most people ask the same questions. Where are you from, what job do you do, or whatever. What ice breakers allow is for you to do that stuff on auto pilot. Each time a new match is found for you, they’ll be sent your ice breaker questions. When you visit the site next, you can review how your matches responded to your questions. Then decide if you want to get in touch with them. If this sounds helpful, you are right, it is. When I’ve used matchmaking sites before many matches I get I know within a minutes of online chat or email that they are not really for me. Ice breakers save you that time and awkwardness. Think about your questions carefully though. If they’re too probing or embarrassing you could find people pass you over and don’t bother to respond at all. What PerfectMatch lets you do is set “Deal Breakers”. These set a minimum bar for your matches. You can’t put in deal breakers on people’s physical appearance. Lots of users have asked for this. But as yet you still can’t do it. So you can’t for example set a deal breaker on someone’s hair color, waist size or their height. Be warned. If you’re too “picky” you might be waiting forever. The more deal breakers you set, the higher you raise the bar and the few people who’ll meet your high standard. The basic account on PefectMatch is surprisingly generous. Given that it is totally free. It lets you explore the site in full and complete your own Duet personality test. You will get matches with the free account. But you’ll only be able to message members who’re on the premium plan. This is called Platinum. The main hitch with that is that it limits your available pool of dating prospects.